Pink Tea Latte: Edible Obsessions | International Waffle Day! Edible Obsessions | International Waffle Day! WAFFLES! I love waffles; therefore, I was not about to miss the day which celebrates my favourite treat! 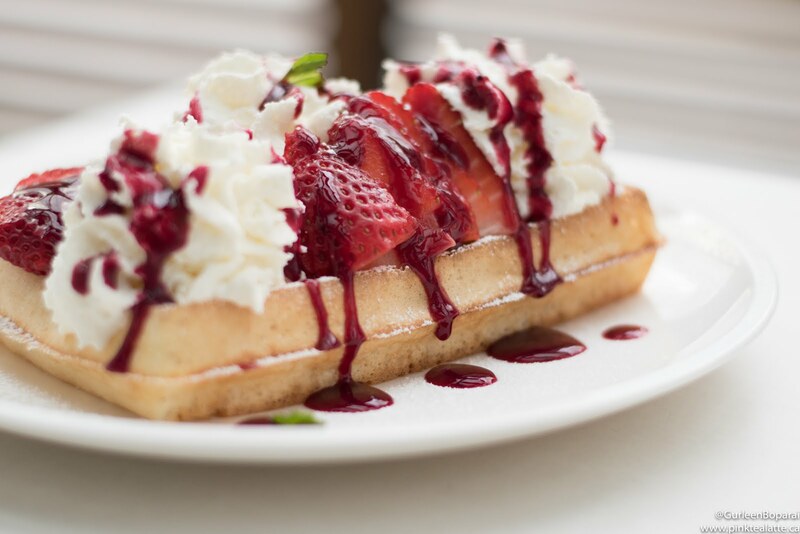 There are some pretty amazing waffles available in Vancouver, but it would have felt like cheating if I did not spend the day at my favourite waffle bar, NERO. So on Saturday, March 25th, I dragged my friends with me to Nero's Seymour location. I ordered my favourite from Nero, The Heaven. 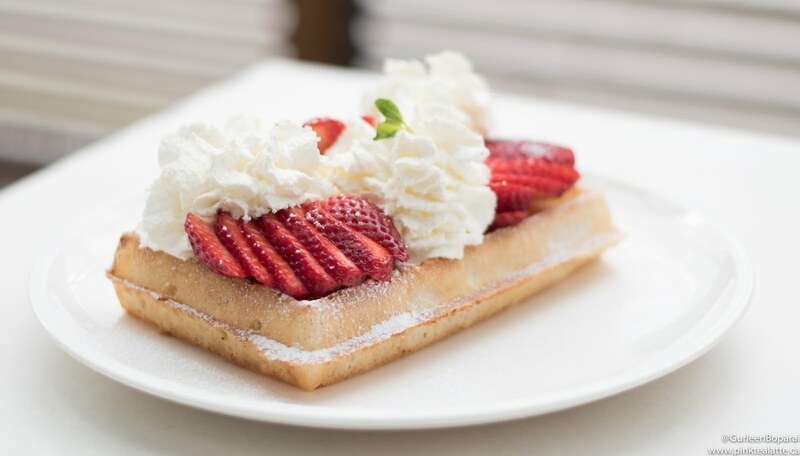 On a fluffy freshly baked Brussels waffle comes thinly sliced fresh strawberries, the most airy whip cream ever, a dusting of powdered sugar and a delicious house made strawberry mint sauce. Since I was feeling extra indulgent, I asked for orange slices on the side which I then artfully sprinkled over my waffle. What keeps me coming back to Nero is their focus on flavour and not the sugar. Their waffles are never overpoweringly sweet and sticky. Even the whip cream is unsweetened and you can taste that it is real cream and not the canned kind from the grocery store. The downside was learning my favourite waitress and friend will be returning back home to South Korea in two weeks time :( I always looked forward to seeing her at Nero, so I am going to miss seeing her run over to give me a big hug. If you prefer something a little more savoury, there are some really amazing savoury waffles in Vancouver too. Nero has a fabulous savoury menu, but for a complete list of restaurants and suggestions, check out the article I did for the Daily Hive! It is my first article for the Daily Hive and I am so excited to share it with you all! Especially since it is on waffles! Where did you go for International waffle day? 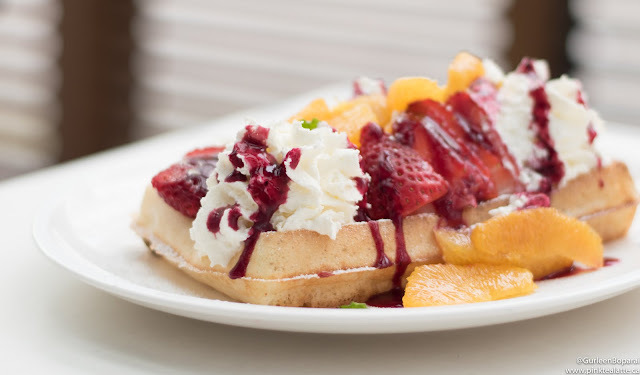 Let me know in the comments below as well if there is a waffle in Vancouver that you think I need to try! Latte Moment | Pink Tea Latte is TWO!